The insults are flying in Friday's papers. The DUP has launched a "warship" taunt at the Irish government in pre-Brexit battle in the Irish Sea. The party's deputy leader Nigel Dodds vented his anger after an Irish Naval ship seized two County Down boats in a cross-border dispute over fishing rights. And a Northern Ireland schoolboy has taken the Duke of Cambridge down a peg or two by failing to recognise the future king when they met in Ballymena. But let's start with the breakthrough on Troubles inquests and the very mixed reaction to the release of £55m to fund new investigations into the deaths of 93 people. 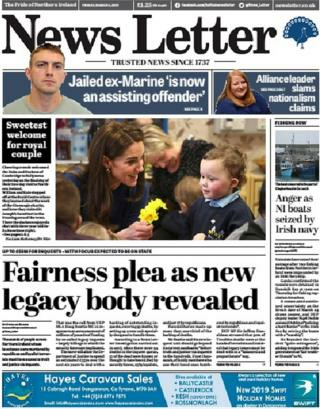 The Irish News says many of the cases involve "shoot-to-kill" allegations and relatives of those who died have welcomed the long-awaited funding. But the News Letter says that about 80% of the cases involved are deaths that have been blamed on either the security forces or loyalists. It refers to its own 2017 research, which found that only 17 of the (then 94) killings were blamed on republicans. It said about a third of the people whose deaths will now be examined in detail were members of paramilitary organisations. DUP MP Sir Jeffery Donaldson tells the paper that paramilitaries were responsible "for 90% of Troubles deaths" and he calls for legacy investigations to be "balanced and proportionate". But the Irish News speaks to a widow of a Troubles victim who went to court last year to force the government to release the funding. Brigid Hughes' husband Anthony Hughes was an innocent bystander who was shot dead by the SAS when they opened fire on an IRA gang in Loughgall in 1987. She tells the paper it has been a "deeply frustrating process" but she now looks forward to finally getting to "the truth" about the Loughgall ambush. Both the front page of the Irish News and the News Letter report on a pre-Brexit border storm that is brewing off Ireland's east coast. Two County Down fishing boats were impounded by the Irish Navy, accused of fishing inside the Republic's territory in Dundalk bay. The Nigel Dodds accuses the Irish government of "policing a hard border in the Irish Sea" and using a "warship" to seize the boats. The Irish News says the fishermen have returned home to County Down but have to raise "significant amounts of money" in order to pay for the release of their vessels. The DUP has its own share of fishy insults in the News Letter, as a former Ulster Unionist Party leader accuses them of backtracking over the Brexit backstop. In an opinion piece, Sir Reg Empey accuses the DUP of "slithering towards a fudge on the legal text to get themselves off the hook upon which they have impaled themselves and the whole of Northern Ireland". Sir Reg also claims the DUP's handling of Brexit has "radicalised Irish nationalism" and pushed a border poll "up near the top of the political agenda". Elsewhere in the paper, Alliance Party leader Naomi Long hits back at claims her party has become increasingly nationalist. "Nationalism does not appeal to me. That is not how I see my politics as a liberal person," she says. Mrs Long points out that she is also often wrongly accused of being a "closet unionist" and said she challenges both unionists and republicans when she feels it is necessary. The Belfast Telegraph leads with a claim that more than half of Northern Ireland motorists have used a mobile phone illegally while driving. That is according to a survey carried out by the Royal Automobile Club (RAC), which spoke to drivers who admitted to dangerous habits behind the wheel. An RAC spokesman said using a mobile phone while driving must be made "just as socially unacceptable a drink driving". 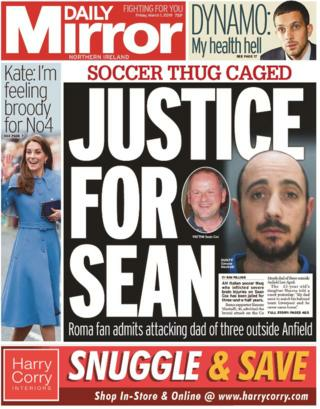 The Mirror leads with the jailing of a "soccer thug" who attacked Irish football fan Sean Cox in Liverpool last year and left him with life-changing brain injuries. Roma fan Simone Mastrelli was sentenced to three-and-a-half years. Mr Cox's daughter told the court her 53-year-old father "went to watch his beloved team Liverpool and never came home". The Mirror's front page also claims that the Duchess of Cambridge told well-wishers in Ballymena that she was feeling "a little broody". But when asked by the proud father of the baby she was admiring if she and her husband were planning a fourth child, she replied: "I think William would be a little worried." The duke has probably had quite enough of being upstaged by younger family members further down the line of succession. On that note, quote of the day goes to Ballymena schoolboy Owen McAuley who shook hands with William as the Royal couple ended their Northern Ireland tour. "I didn't know who he was," admits 10-year-old Owen. "Someone told me he was Harry's brother, then I knew." There is no such sibling rivalry in Naul, County Dublin, which is home to Ireland's biggest ever Euromillions winners. A family syndicate from the village scooped 175m euros (£152m) on the draw last month and have reportedly decided to share the love around. They are to split the cash 49 ways, according to the Mirror, which spoke to an unnamed friend of the family as they celebrated their winnings in a local pub on Thursday night. That could mean that a lucky circle of their nearest and dearest would get just over £3m each. "I think there's going to be a lot of happy people today," the friend tells the paper.